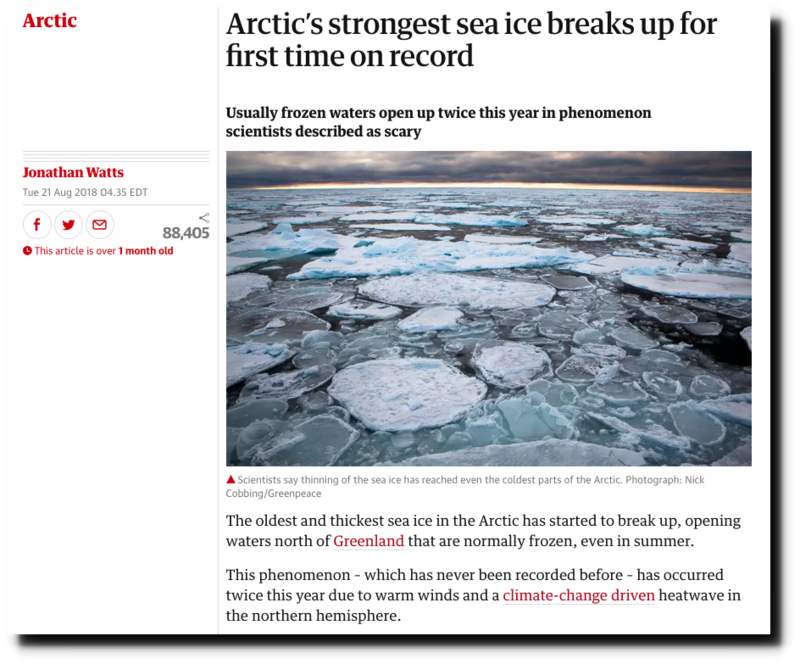 A few weeks after announcing the demise of Arctic sea ice, the Guardian says there is too much sea ice – and it threatens Elizabeth Warren’s northern relatives with starvation. Well the inuits have enjoyed more drastic cold . Elizabeth Warren is only responsible for heating ( of her arguments ) . As a native yankee life is no fun . “People here in the circumpolar north are aware that we could very easily be cut off,” says Dr. Milan Shipka, Associate Director of the Agricultural & Forestry Experiment Station at the University of Alaska Fairbanks and co-coordinator of a recent conference on Circumpolar Agriculture. Due lack like crop pests like weevils in Alaska, Bryce Wrigley was able to produce higher crop yields than growers in the south. There’s only one thing you need to grow food in the north: gumption. The additional daylight hours don’t hurt either. And, perhaps, a small nuclear power plant for grow lights and waste heat to warm when completely dark. You want to be food-independent? Energy gets you a long way there. Its not like the ice ‘suddenly’ did not melt. Anyone actually looking at the ice concentrations and movement could see that the risk was rising, and could have made other, perhaps more expensive, plans to bring in essentials. The alternative? Do without. And, perhaps a low-volume de-sal plant. Both the water and the salt are useful. Wait- the same sea ice that that causes starvation for polar bears when it does not exist is causing starvation for the Polar-Warrens when it does exist? Though the polar warrens and the polar bears share the same hunting territories and eat the same stuff to survive? I still do not understand why the russian polar warrens can get along with the climate as they did in the past 10.000 years and noone cares while in the USA everything is just 5 seconds away from extinction. Perhaps Canada needs to rethink its priority list of who gets what when. An alternative, I suppose, would be to see if they can rent some Russian icebreakers to open the way. And speaking of icebreakers, I wonder how the job they are doing in the Arctic – busting open sea lanes – affects the cycle of the ice? After all, if you are breaking up sheets that might not otherwise have been broken, would that not affect how well the ice recovers to winter maximum as well as overall thickness? Seems to me it would affect the ice the same as the winter storms that shift and crush the ice, just on a different scale. Put another way, perhaps the usage of ice breakers has slowed the process moving towards the next ice age to some degree, though in the end, it might make it worse. Tom … there were lots of ice breakers available to get the barges through but the problem is the freight comes on barges which are pigs in ice vs using actual ships which likely could have easily followed the ice breakers. They went with the cheaper option and paid for it. 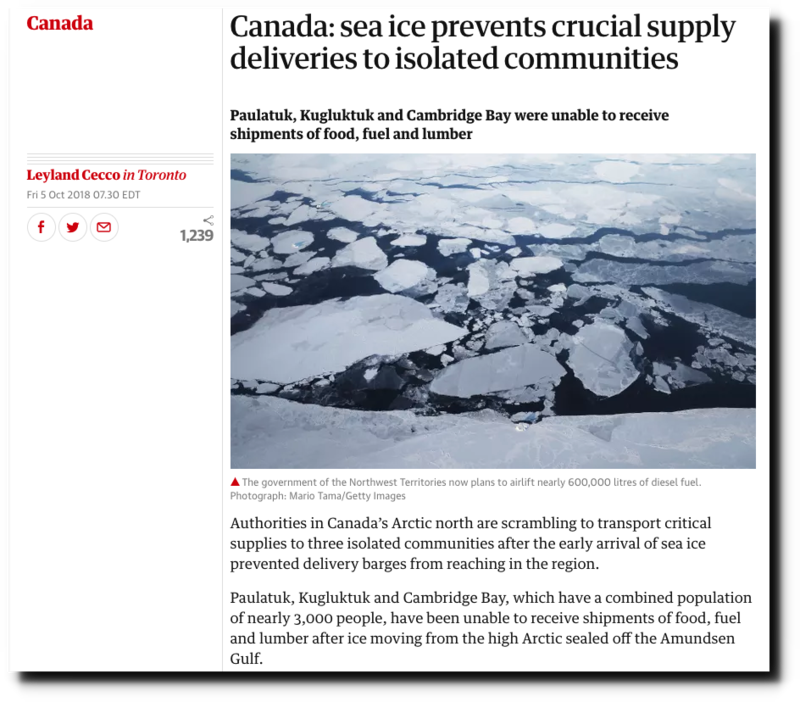 And reading the reports and interpreting what is being said and not said it looks as if government incompetents delayed the barges to the end of the shipping window, likely thinking it was risk free to do so because experts say the ice is all melted and then lots of ice had drifted in, piled up into ridges etc and blocked access to these communities. Many arctic communities did get their supplies earlier in the summer shipping season and so this is a timing error and maybe just a bunch of bad luck. Very wintery up there now with even Churchill Manitoba showing -10C a few days ago.